This is one if the best things to eat at night when out thinking about eating. [UPDATE] People sent in complaints for not fully describing this piece of food. Here are the details. The sandwich was made at Delucas in Boston, more on that in a minute. 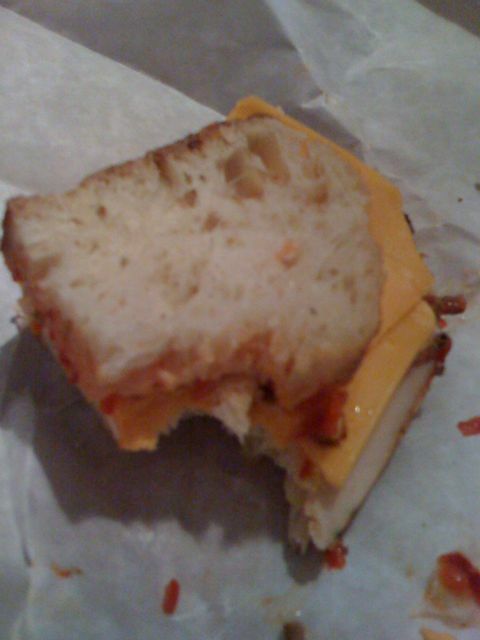 This sandwich was basically turkey, cheddar, and hot peppers on sour dough. Though basic, it was one of the better sandwiches my mouth has had in it. It went down well. It had some spice. The bread was tasting great. Just the right amount of turkey. The turkey may have been some special kind of turkey and not just plain because it was tasting so good. The cheddar was orange and tasted as expected. Overall this was one killer sandwich. Unfortunately all is not well. The owner of Delucas is a Douche Bag, which brings down the total score to….. 4 Fist Pumps out of a possible 10. And are you telling me those aren’t bacon bits?